ALL STUDENTS: See the Financial Support & Scholarships page for details about a course-specific award which can be applied towards the cost of enrolling in Marine Parasitology and Disease and other select SML courses for summer 2019. 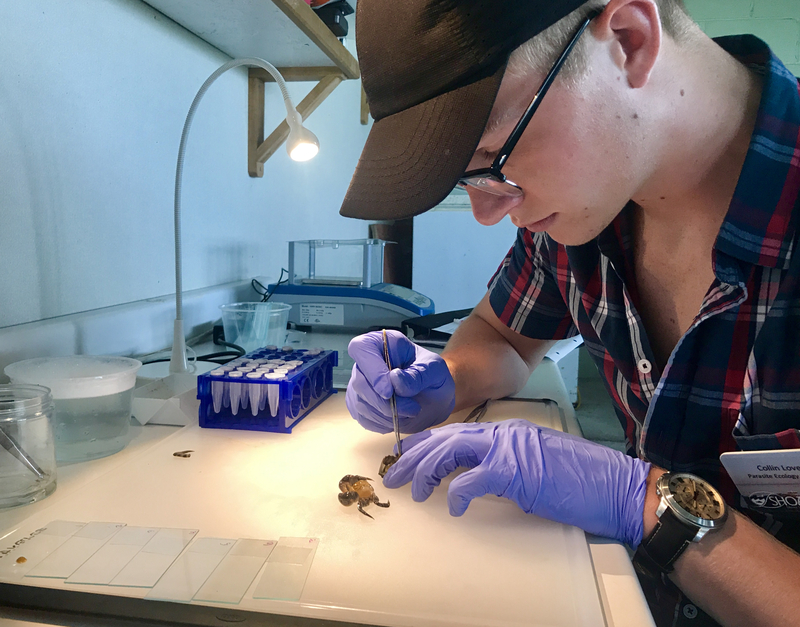 Collin Love, 2017 Parasite Ecology Intern, extracting parasites from a green crab. The Blakeslee Lab on Appledore in 2017. Dr. Blakeslee is center. Dr. Fowler’s general research interests and experiences include global aquatic invertebrate species patterns, biodiversity, phenotypic plasticity, parasitology, and community and population level interactions of aquatic invertebrates, especially those concerning invasions. She has experience working in freshwater, estuarine, and marine systems both in the United States and globally. Currently, her laboratory at GMU has three main topics of study: host-parasite interactions, invasion dynamics and processes, and natural resource management of commercially and recreationally important aquatic invertebrate species.